Ashton Kutcher fans who can’t get enough of the star on Twitter are about to get some very good news. And the rest of you — even if you aren’t necessarily huge Ashton fans — will want to pay attention too. Mr. Kutcher, who will be interviewed by Charlie Rose at TechCrunch Disrupt tomorrow, is teaming with UberMedia to launch a customized, branded Twitter client called A.plus that runs using Adobe AIR and is available for both Mac and Windows. You can download the app right here. It’s a big deal. 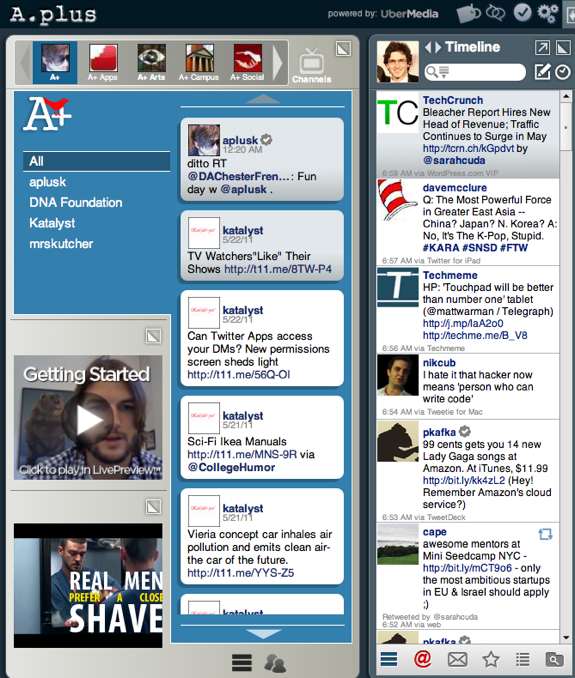 Kutcher is the 7th most popular user on the entire service, with over 6.8 million followers. Using the new UberMedia client, he will now be able to directly monetize that following, and he’ll also have much greater control over the way his tweets are presented. You see, despite the fact that Kutcher has a massive Twitter following, he also has a lot of competition — if you’re following a few dozen active Twitter users, then his tweets might only show up on your screen for a minute or two, and unless you spend a lot of your day monitoring Twitter, you’re probably going to miss a bunch of his updates entirely. As you can see in the screenshot above, A.plus looks a bit different from your standard Twitter client. There’s the Twitter stream we’ve all become accustomed to, with a section for @replies, private messages, and so on. But to the left of that is another panel that’s also filled with content. Unlike the regular Twitter stream, which UberMedia isn’t allowed to insert ads into because of Twitter’s Terms of Service, these additional widgets can be customized with whatever Kutcher wants — photos, video clips, messages longer than 140 characters, or ads. And they’re persistent, so you can have his stream visible at all times. Right now, this area is used to showcase a handful of channels, which are essentially Twitter Lists that have been curated by Kutcher. Open the channel called A+ Arts, and you’ll see tweets from Ustream, nowmov, BuzzFeed, and Art.sy among others. Head to the A+ Social channel and you’ve got LikeALittle, Dailybooth, and foursquare. As you might expect, some of the accounts that are featured happen to be companies that Kutcher has invested in. He’s also featured some of the causes he supports, like his philanthropic DNA Foundation. In addition to these lists are a pair of banner ads, and an integrated deals platform (enter your zip code, and you can receive deals directly in A.plus). All of these can be used to generate revenue — UberMedia isn’t getting into specifics, but Kutcher will be able to monetize some parts of the app, and UberMedia will monetize others. Okay, so A.plus lets Kutcher steer some of his fans towards his favorite Twitter accounts, and it’s letting both him and UberMedia directly capitalize on his popularity. But why would anyone, aside from Ashton’s biggest fans, want to use A.plus in the first place? The biggest reason is a feature called LivePreview: as you read through your Twitter stream, the app will actually pre-cache links that have been shared by the people you follow. Click one, and the page will pop up in a custom browser within the application — you don’t have to swap to another window. Hit the down arrow on your keyboard, and the minibrowser will show whatever the next piece of shared content is, be it a photo or a website. Because this content is precached, you can probably browse through these links more quickly than you would with a traditional Twitter client. It actually feels a bit like jumping through articles in an RSS reader. If that sounds appealing but you’re not such a die-hard Kutcher fan, you’ll be happy to know that you can minimize any of the panels you aren’t interested in (including all of the Kutcher-centric content). In other words, you can prune this into a pretty standard Twitter app with a few clicks. I have been playing around with the app since last night. It’s built using AIR, so there’s the same UI wonkiness you get in other AIR apps (non-native widgets, scrolling can feel a little weird, etc.). But really, most of the people interested in A.plus because of its focus on Kutcher probably aren’t going to sneer at non-native UI widgets. And AIR certainly didn’t hamper TweetDeck. UberMedia is thrilled that Ashton Kutcher wanted to be their launch partner on this — the actor has been ahead of the curve when it comes to leveraging social apps, and you can be sure he’s going to drive a lot of attention to it. But the company also has much bigger ambitious. UberMedia founder and serial entrepreneur Bill Gross says that the application is the first of many — we’ll be seeing more celebrities and media properties launching branded apps of their own in the future. And there may eventually be a version of the app that isn’t branded. For the time being, though, A.plus is the only application available that has these features. This is, of course, only the latest move in UberMedia’s strategy to monetize Twitter (something that Twitter itself hasn’t been so great at thus far). The two companies have recently been at odds — UberMedia has been acquiring a slew of Twitter apps over the last several months, and Twitter temporarily shut them all down after claiming that UberMedia was violating its Terms of Service — a move that Gross said took UberMedia by surprise. Then came news that UberMedia was in the midst of acquiring hugely popular Twitter client TweetDeck, which would give it much more leverage against Twitter. Twitter itself is now reportedly gunning for the company to keep it out of Gross’s hands. Which brings us back to A.plus. UberMedia is now offering brands, celebrities, and media properties a way to directly monetize their audience. Granted, this is hardly the first branded Twitter app — we even saw a TechCrunch-skinned TweetDeck back in 2009. But this gives partners far more flexibility over the content they’re sharing, and how it’s presented. If it works well for Kutcher, don’t be surprised if we start seeing a slew of similar apps from UberMedia in the coming months.